Located on the corner of Thomas and Flourtown Roads in Whitemarsh Township. With its 14 acres preserved in 2014 and boardwalk measuring nearly two-thirds of a mile, the Preserve is a haven for birders, walkers and those who enjoy the area’s natural flora and fauna. The property is a living laboratory for the study of early farming and agricultural life, ecological issues, sustainability and land stewardship. It offers inspiration, recreation and education for visitors and community members from the Whitemarsh Valley and beyond. Since 2013 The Foundation has participated in the Cornell University Bluebird and Tree Swallow Nestwatch research program conducted by volunteers from The Hill at Whitemarsh. Moving forward, The Foundation’s goal is to partner with local educational organizations to utilize the landscape as an active community learning center and context for place-based education. The Dixon Meadow Preserve uses best practices in meadow management centered on maintaining a meadow habitat keeping it from natural succession that would lead to the development of a woodland or forest. A “meadow,” comprised mostly of warm season grasses and wildflowers, is a special habitat that is aesthetically pleasing and nutrient rich supporting a diverse population of birds, animals and insects. 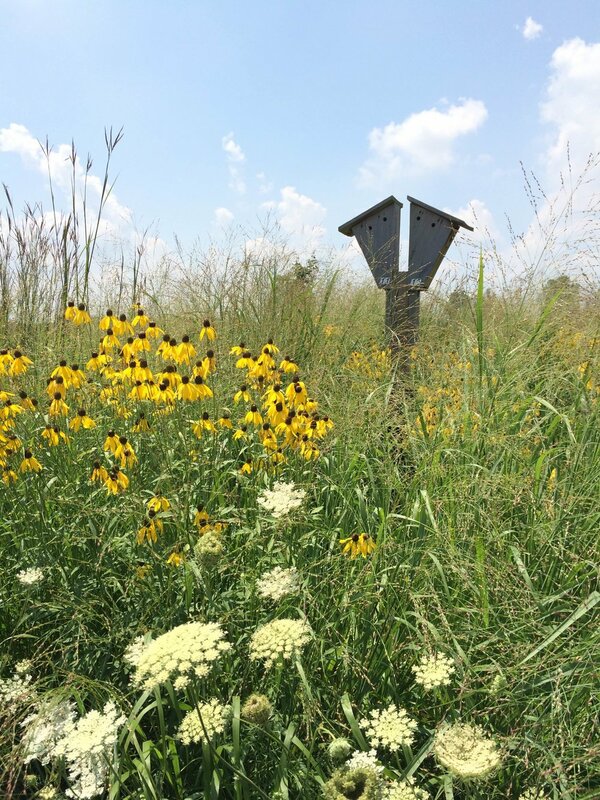 Native plant materials are the foundation of the Dixon Meadow Preserve which is carefully managed with good horticultural practices, and little use of chemicals to control invasive species. Plants are selected to be resistant to deer pressure. The primary tool to sustaining a meadow is annual mowing in irregular patterns each year to provide high habitat value for breeding wildlife and to attract transient species. Covering 14 acres of land, the Dixon Meadow Preserve includes there quarters of a mile of boardwalk and multiple native species of flora and fauna. A destination where birders have spotted over 130 individual species of birds, plus fox, deer and groundhog, the Dixon Meadow Preserve is a gathering ground for native wildlife including the Monarch Butterfly. The Preserve has an abundance of milkweed. This is where the monarchs lay their eggs and milkweed is the only food the catipillars eat. The August-September born monarchs make their migration, which can take as much as up to two months from North America to Mexico.